When you take out our VOSS Client Card you will obtain a discount of 10% off your purchases and also we will give you a gift voucher with the value of 10€ off your first purchase with our VOSS Client Card. A new world of first brands which we provide to you in our exclusive stores. We represent a reference for lovers of good taste who wish to always wear the newest and latest tendency garments. Our network of stores continues growing every year and we have multiple establishments in the north of Mallorca. 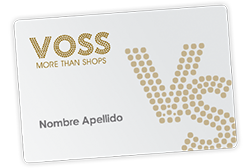 Come to one of our VOSS stores and enjoy the advantages of what your VOSS Client Card offers, with which you will be able to benefit from an uncountable amount of discounts on your purchases.